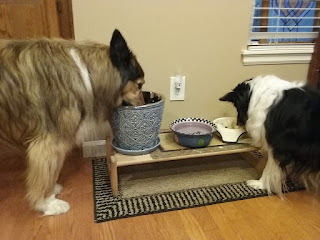 Because Indy eats so fast and has no hesitation in moving into Scouts bowl, I had to come up with several modifications. 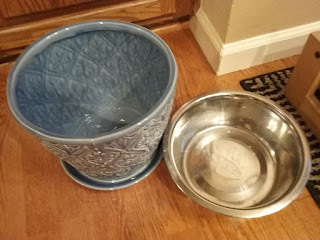 I got Indy a bowl with chambers and I would hold some kibble out to toss and distract her away from Scout. Eventually I placed his bowl into a tall flower pot so that is was mostly out of Indigo's reach.